After moving to Oakland, KRK quit his job at Last Gasp, but not before selling a sunstantial amount of original art to his boss, Ron Turner. Ron currently owns one of the largest collections of KRK's art. 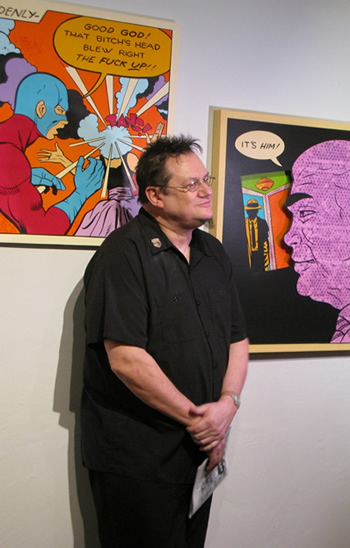 With the help of his manager, Michael Pilmer, who also handles Mark Mothersbaugh art shows) KRK has done group shows and one-man shows all over the country. At RVCA, a cool clothing company in Huntington Beach, California, KRK did a two-man show with Mothersbaugh called Dos Mutatos. It was attended by the likes of Devo's Gerald Casale and Weird Al Yankovik. In 2003, KRK got a theremin. A theremin is an electronic musical instrument mostly known for the 50's sci-fi movie eerie sounds, and the "woo-woo" part of the Beach Boys' song "Good Vibrations." Using the theremin as a lead instrument, KRK formed his band: Ken the Magic Corner God. The name of the band was created by his friend Dennis Todd in 1986 in an auto body shop, while on drugs. Dennis is supposed to be in the band playing lead guitar, but as of the time of this update, he has not shown up for a show or any rehersals. Josh Mcloud plays brilliant keyboards. At Safari Sam's (in Hollywood) KRK did a one-man show called Globoid Fun. Ken the M.C.G. performed with Devo's Boogie Boy, who sang "You Got Me Bugged". It was the only solo performance that Boogie Boy (Mark Mothersbaugh) has ever done. It can be seen by going to youtube.com and entering "Boogie Sings U Got Me Bugged." or you can just click here and go straight to the video. Whichever. In early 2009, KRK curated his first art show called "The Panelists." Held in Phoenix, Arizona, it featured sixteen artists who painted comic-book panel art in the Roy Lichtenstein style. The artists created two eight foot high comic book pages. The story "Love on the Run" was outlined by KRK. Amoung the participants were Mark Mothersbaugh, The Pizz, Anthony Ausgang, Spain and Niagara Detroit. KRK currently creates solo and group art shows around the country, with a possible one-man show in New Zealand. Check out the "Events" section for the show nearest you, Spud! KRK is home right now. Give him a call.